crop! So, job two: put in a stake. 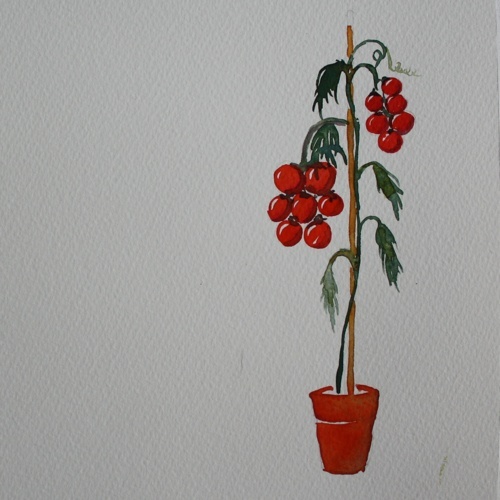 It strikes me that we can be a bit like tomato plants. We chase after (and give honour to) gifting and anointing (tomatoes) and are apt to neglect the less exciting foundations – reading the bible/prayer (pot) and character (stake). All three are important. Just as a huge plant can’t manage without a sizeable pot and stake, there is no point in having a fantastic pot, but no fruit. All three have to grow together. Understanding, character and gifting, tied together with a relationship with Jesus which gives life to them all. Which is your fruitfulness more likely to be limited by – lack of character or understanding, or lack of attention to identifying and growing your gift? How can you invest in that area more so that your own fruitfulness is not limited? How can you invest in other people in a balanced way? Previous PostThere’s no place like homeNext PostReady to walk on water? Oh yes! Yet again I thank God for his perfect timing to read this! I was just right in the middle of a situation where I really didn’t feel at all gracious, compassionate, kind, gentle or patient. Quite the opposite! This post reminded me that yes, of course I do really long to be able to respond to situations with these ‘fruits’, and that in order to produce the fruit I needed to go and sort out my ‘pot’ and ‘stake’! Some time spent reflecting and praying and also reading Colossians 3 has given me a different and much more positive response in this situation to the one I was heading for. So thank you again for sharing.